On Jan. 9, 2018, New Jersey-native Paul Goresh died at 59 years old. While many Beatles fans might not know his name, they most certainly know his work. On December 8th, 1980—the darkest day on the Beatles’ calendar — Goresh, then 21, photographed John Lennon signing a copy of Double Fantasy for Mark David Chapman, the man who would murder the former Beatle just a few hours later. For Goresh, Dec. 8 marked yet another opportunity to catch a glimpse of his idol in the flesh. Armed with his Minolta XG1, the amateur photographer took up what had become his usual post outside the Dakota, the Gothic Central Park West apartment building where Lennon lived with Yoko Ono and their five-year-old son Sean. Goresh first met Lennon and Ono back in February 1979 after stirring up the courage to visit them in their apartment. “When I knocked on the door I didn’t expect John himself to answer,” Goresh later recalled, “but there he stood, gold-rimmed glasses, chewing gum and smiling.” Apparently, Goresh’s enthusiasm had gotten the better of him, and he rapped a little harder on the door than he planned. “I thought it was the cops,” Lennon quipped as he opened up the door. For Goresh, his casual meetings with Lennon outside the Dakota were a dream come true. “I will always cherish the meetings I had with John. He was very gracious to me, and the more I saw and photographed him, the more charming he became. John always took several minutes of his precious time for me, although the word ‘precious’ doesn’t justly describe what my many times with John mean to me. In the almost two years I knew John, he was always a gentle, kind person.” In November 1980, Lennon turned the tables on the amateur photographer, good-naturedly posing for a picture with Goresh. For Goresh, the news of Lennon’s death left him with a great sense of personal loss. But over the years, he would find solace in John’s final gift to him. In the last weeks of the Beatle’s life, Lennon and Goresh enjoyed a running joke involving an autographed copy of John’s 1965 book A Spaniard in the Works. Somehow, the book never quite seemed to find its way into Goresh’s hands, shuttling between the Dakota’s front office and Lennon’s apartment upstairs. But on December 8th, the mystery finally seemed to have been resolved, with Lennon telling him that he had finally signed Goresh’s copy of A Spaniard in the Works. “Don’t forget your book!” said Lennon as he departed for the Record Club with Ono. For his part, Goresh couldn’t help but laugh at the thought of finally getting his hands on that elusive book. A week after Lennon’s murder, Goresh came home to find the signed copy of A Spaniard in the Works in his mailbox. Devastated in his grief, Goresh not only found solace in Lennon’s parting gift, but also in Ono’s warmhearted embrace. “It was Yoko’s kindness which helped me accept John’s death a little more easily. She opened her doors and her heart to me,” Goresh recalled. 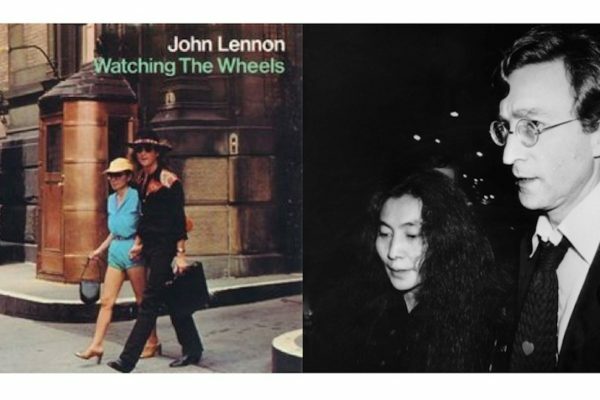 She even chose one of Goresh’s photographs to adorn the sleeve of the “Watching the Wheels” single, the final single released from Double Fantasy in March 1981. But for Goresh, the photographer’s most salient memory would always take him back to that last afternoon with Lennon. “That smile, that wave, our handshakes that day are always imprinted fondly with lots of love in my heart.” In his own way, Goresh wasn’t merely a fan. He was one of us. PS. This is Ken Womack’s first post for CultureSonar, and we welcome him! Ken is an internationally renowned Beatles authority regarding the band’s enduring artistic influence. He is the author of Maximum Volume: The Life of Beatles Producer George Martin (The Early Years: 1926-1966). The second volume in the series, entitled Sound Pictures: The Life of Beatles Producer George Martin (The Later Years, 1966-2016), is forthcoming in 2018. His previous Beatles-related books include Long and Winding Roads: The Evolving Artistry of the Beatles and The Beatles Encyclopedia: Everything Fab Four. You can learn more about Ken’s work at kennethwomack.com.